"I want to eat meat" is what Father D proclaimed as we were leaving Downtown. For a fleeting moment, I thought of heading to Samba; but we weren't that hungry. Besides, I was already robbed by the parking meter of all my spare change. I wanted to leave Downtown pronto! I figured we could go to the Brave Bull; yet it was not open for lunch. So there we were driving down Commercial Drive looking for eats. We drove right past Memphis Blues, Vera's and ended up at Bandidas. Uh... isn't that a vegetarian joint? Yup, I brought Father D to a veggie place when he wanted meat. And worst of all, I had to park at a meter. Scr ounging up all the loose change I had left, which were mostly dimes, I fed the meter enough for 40 minutes. Well, we'd have to eat fast. 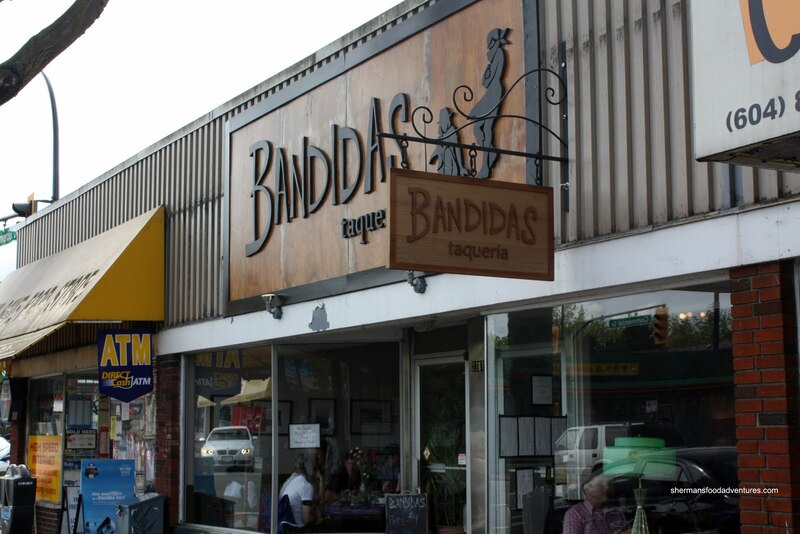 As mentioned, Bandidas is a vegetarian restaurant specializing in Mexican food. So instead of ground beef, we find tofu. That didn't sound all that appetizing to Father D. I'm not even sure if I did a good job in making tofu look good. I think I mentioned that it tasted like linoleum... Hey, I'm into tofu and wasn't all that concerned. We started sharing 4 soft tacos - 2 each of the Leona Gayle and the Camillo. Consisting of smoky-sweet chipotle organic tofu, pinto beans, cheese, roasted red salsa, romaine lettuce & sour cream, the Leona Gayle was okay, but not as flavourful as the ingredients would suggest. I personally wasn't a big fan of the corn tortilla, it was dry and hard. 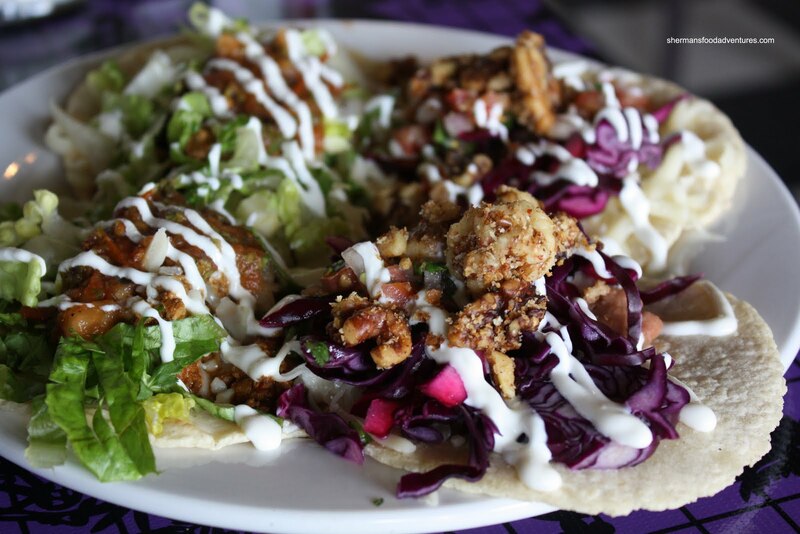 However, I really liked the Camillo with its spicy breaded walnuts, pinto beans, cheese, purple cabbage, fresh red salsa and sour cream. For me, it was the crunchy walnuts that made the taco. Just the texture and sweetness was all it needed. 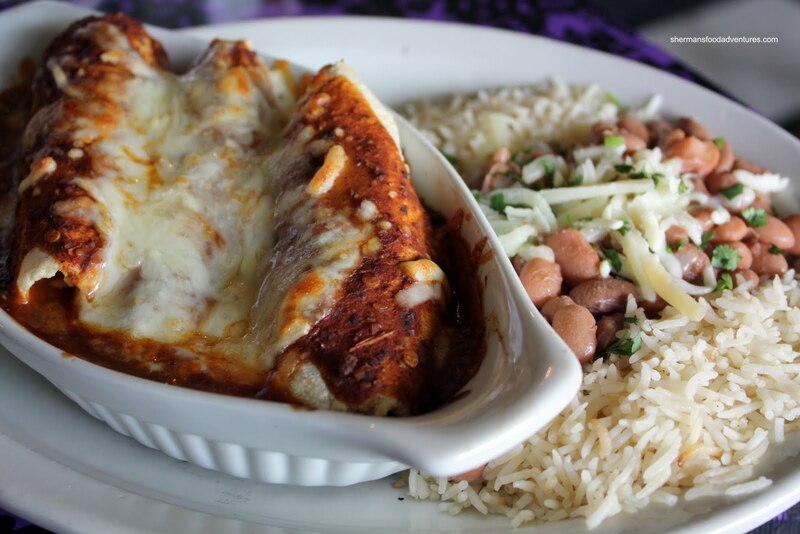 For my main, I had Dave's Enchilada filled with jack cheese and sweet chipotle tofu topped by a house-made mole. From what I could taste of the mole, it was slightly smoky and sweet. The flavour from the tofu detracted from the mole; but not in a bad way. I really enjoyed the tofu (didn't miss the meat). 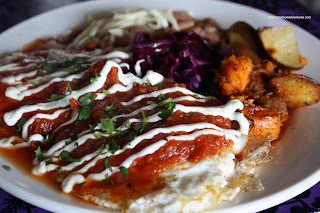 Father D had the Heuvas Rancheros which consisted of 2 free range eggs on corn tortillas with ranchera sauce, sour cream, pinto beans, roasted yams and potatoes. Although everything on the plate was good, he wasn't a huge fan of the sauce. The whole thing became a bit watery. Like me, he wasn't a big fan of the tortilla; but he did really like the potatoes. By virtue of being meat fans, we were okay with the meal; yet slightly indifferent. We could see why Bandidas is so popular with its big portions, creative use of veggie ingredients and energetic vibe. I think this summarized my thoughts of Bandidas Taquería: "didn't miss the meat". LOL Kim! I thought of that too! The only reason I spelled it the way I did was that it appears as such on their menu. I guess they misspelled it too! "And worst of all, I had to park at a meter." OMG, you are *so* Chinese. Was at Bandidas about 3 weeks ago. Had 4 small soft tacos and one enchilada with rice & beans on the side. For some reason, the entire meal tasted very very bland to Mrs. LR and I. Even the salsa felt lame. Service was spotty and somewhat disorganized. This contrasted our first two times there in 2009 not long after they opened. Frankly now I'm finding their menu too predictable and limiting (not even a shred of cilantro in any of the tacos, but what's all this red cabbage deal ?!? ), and for about the same $ I may as well go up to Dona Cata and get my fill of carnitas, longanizas, bisteck and barbacoa de borrego .... MMMMMM. Just don't let Father D read this ! chipotle tofu? this sounds like my kind of place, why haven't i heard of it? now to combat the fear of eating alone... do they do take out? Trisha, you share the same fear as I do??? LOL... I think they do take out! Yup, BT does take out. Get the take out menu, call ahead to order and voila. Hey ! If you kind of like the feel of this place ( i just went probably two weeks ago) go try a place called foundations on main and ...5th i think? If you go, go at night and bring a couple of friends and try their nachos. They are def to die for and very cheap.Not to mention for the price you're paying you get a hugeee portion. its a veggie place to but i'd say the portions, taste, and prices are better than bandidas. Foundations isn't really a Mexican fusion-ish restaurant but you'll def get the hipster vibe. The burgers are also very filling and tasty ! LOL, I've been wanting to go to the Foundation for awhile now. Everytime, my friends vote against it! I promise you wont regret it !